The thyroid is a butterfly-shaped gland which is located in the anterior region of the midline of the neck, in front of the larynx and the trachea. It is composed of two lobes, the right and the left, which are connected by a narrow strip of tissue known as the isthmus. The isthmus occasionally possesses a small pyramidal lobe on its superior aspect. The average weight of the thyroid gland is 20-60g. The two lobes of the thyroid extend posteriorly around the trachea and larynx to reach the oesophagus and the carotid sheath (in which the carotid artery runs). A further anatomical relation of the thyroid gland is the left recurrent laryngeal nerve which is a branch of the vagus nerve. During embyrogenesis the left recurrent laryngeal nerve becomes stuck under the ductus arteriosus and is dragged down into the thorax. As the only thing the left recurrent laryngeal nerve wants to do is to innervate the muscles that control the left vocal cord (and deliver parasympathetic fibres to the thyroid), this is a rather incovenient detour for it and means that the nerve has to climb back up into the neck for the thorax. Nevertheless, this is not simply an anatomical idiosyncrasy but is a potential disaster in thryoid surgery because it is possible to cut the left recurrent laryngeal nerve and thereby paralyse the left vocal cord. As befits an endocrine gland, the thyroid gland is a highly vascular organ and is supplied on each side by the superior thyroid artery (a branch of the external carotid artery) and the inferior thyroid artery. The veins are similarly designated and drain into the internal jugular and brachiocephalic veins. The lymphatics drain to local midline lymph nodes. 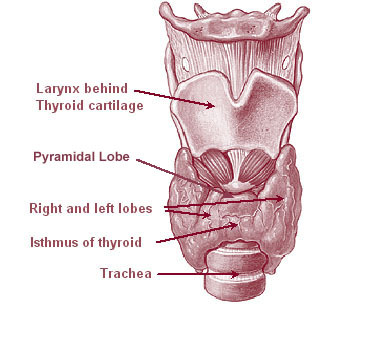 The thyroid is derived embryologically as an outpouching from the base of the tongue called the foramen caecum. This outpouching adopts a bilobed shape and descends in the neck to reach its final position. The young thyroid gland remains connected to the base of the tongue by the thyroglossal duct. 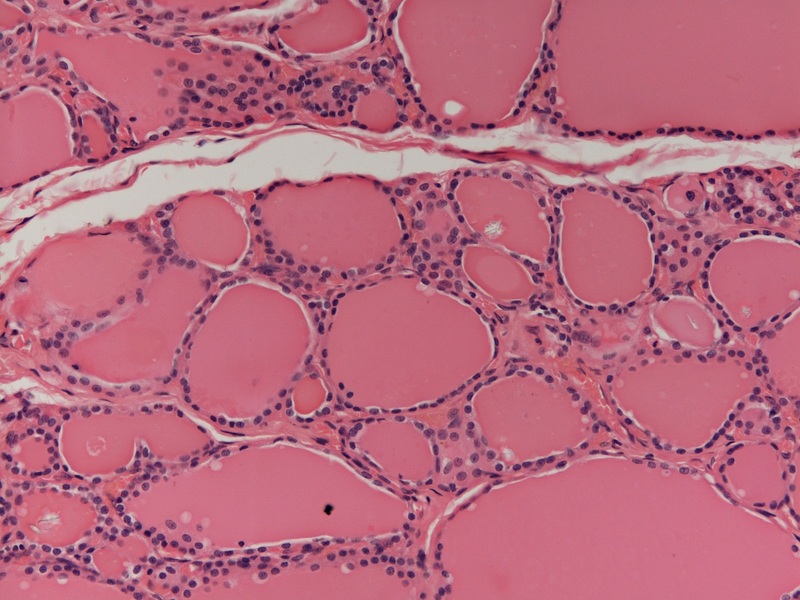 This thyroglossal duct usually atrophies but occasionally may persist to form a palpable mass, either a patent duct or an enclosed thyroglossal cyst. The basic structural unit of the thyroid gland is the thyroid follicle. Each follicle is lined by columnar epithelial cells and contains a central lake of thyroid colloid. The follicular epithelial cells produce thyroxine and tri-iodothyronine and use the iodine that is stored in the colloid for this synthesis. The follicles usually have either an ovoid outline but if the thryoid gland is very active they may develop internal folds in order to increase the surface area of colloid which is available to the epithelium. Scattered between the follicles are small groups of cells known as C cells. The C cells secrete calcitonin. Unlike the rest of the thyroid gland the C cells are derived from the fourth pharyngeal pouch during embryogenesis and fuse with the baby thyroid gland as it makes its way down the neck. Low power view of a normal thyroid High power close up of some thyroid follicles. The principle function of the thyroid gland is the production of the two thyroid hormones, tri-iodothyronine (T3) and thyroxine (T4). The ratio of T4 to T3 secretion by the thyroid gland is about 9:1. However, T3 is approximately four to ten times as potent as T4 and is the active form; much of the conversion of T4 to T3 occurs in the target tissues. Despite this, discussions of thyroid function typically employ the word thyroxine to cover both T4 and T3. The role of thyroxine is to accelerate various aspects of metabolism, in part by potentiating the actions of the sympathetic nervous system. The heart rate is elevated and sweating is increased, as is the production of heat. Glucose levels are raised by promoting the breakdown of glycogen and inducing gluconeogenesis; fatty acids are also mobilised. Both the creation and degradation of proteins are stimulated. Neurological arousal occurs. Muscular activity in the GI tract is increased and skeletal muscles are primed for contraction. Thyroxine is also crucial to the development of the brain in utero and also provides metabolic assistance to growth during childhood and adolescence. The synthesis and release of thyroxine by the thyroid gland is controlled by the pituitary gland. The release of thyroid stimulating hormone (TSH) by the pituitary gland. The secretion of TSH by the pituitary gland is in turn stimulated by the delivery of thyroid releasing hormone (TrH) to the pituitary gland by the hypothalamus. The hypothalamus generates elevated levels of TrH in response to situations in which the body's metabolism needs a boost, such as a cold environment or stress. As with most hormonal systems there is a basal level of activity in the TrH-TSH-thyroxine system and this allows modulation of the effects of the system by both increases and decreases of levels of the hormones. Iodine is essential for the generation of thyroxine and triiodothyronine and is avidly concentrated by the thyroid gland in colloid. 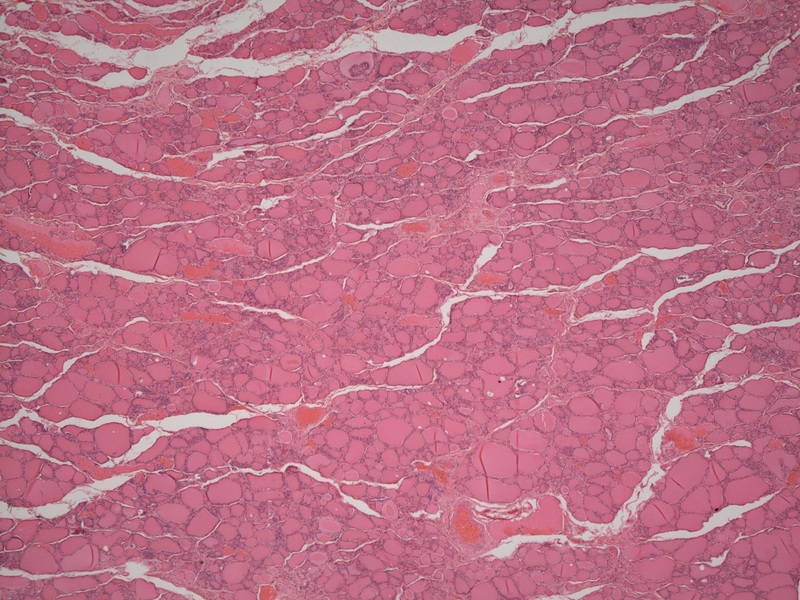 Colloid contains the protein thyroglobulin. 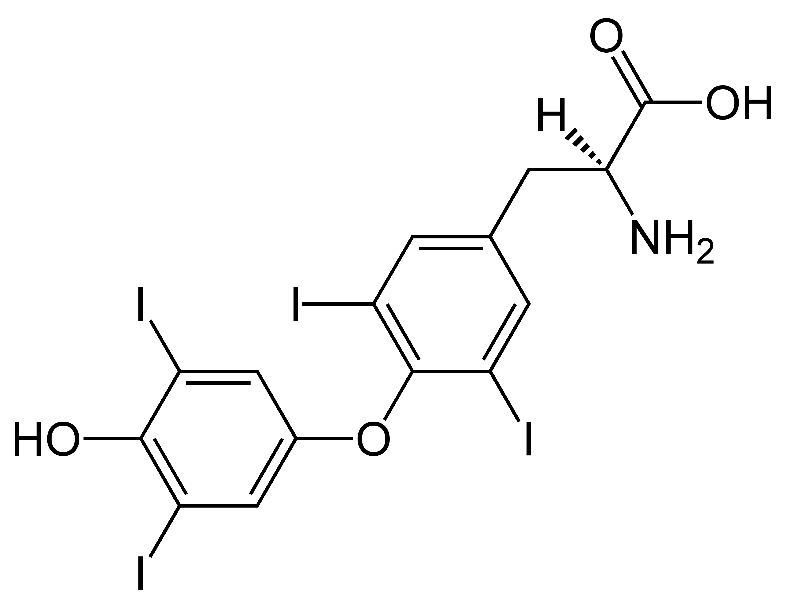 Iodine is bound to the benzene ring of the tyrosine residues of thyroglobulin to give monoiodotyrosine and diiodotyrosine. 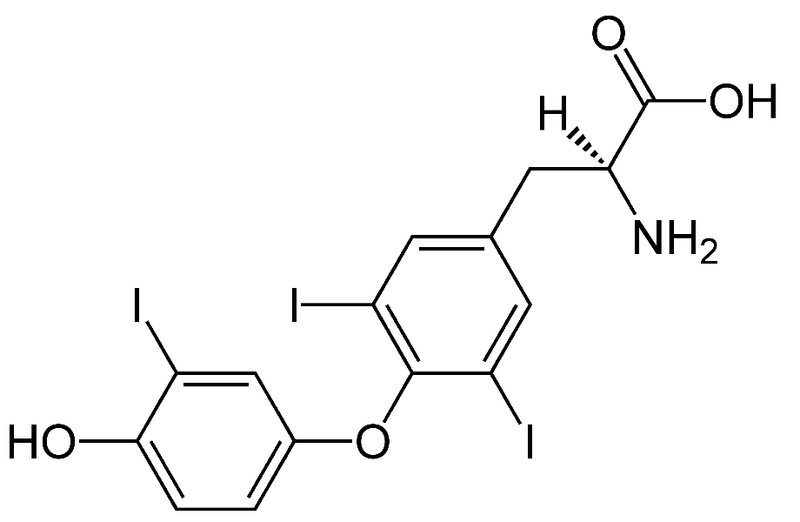 Thyroxine (T4) is created from two molecules of diiodotyrosine while the recipe for tri-iodothyronine is one molecule of monoiodotyrosine and one molecule of diiodotyrosine. Most of the thyroxine in the blood is carried bound to proteins. Two of these are special proteins for thyroid hormones (thyronine binding globulin, which prefers T4 and transthyretin, which likes T3 better); the third is the workhorse plasma protein, albumin, which does not have specific binding capacity for thyroid hormones but ends up carrying some of them simply because albumin is abudant. Binding of thyroxine to proteins increases the lifespan of the hormone. Calcitonin risks being the forgotten hormone of the thyroid gland, not least because it does not seem to be particularly missed by its absence if the thyroid gland is removed. It is a peptide hormone which has thirty-two amino acids and is produced by the C cells of the thyroid. It lowers blood calcium and in general is antagonistic to the actions of parathyroid hormone. Part of calcitonin's mechanism of action on blood calcium is accomplished by inhibiting the release of calcium from bone and in this sense the hormone's role may be as much to protect bone mineralisation as to reduce blood calcium.